The heartfelt outpouring of sorrow from the media attention and subsequent donations from all over the world for the victims of the Tsunami December 2004 was unprecedented in recent history. The world organizations and specific country resources was for the first time matched by individuals and small groups who were able to help by targeting smaller locations like Phi Phi island. Update: "In July 2008 little is left to remind you of the scenes of devastation. The bull dozers cleared the rubble, the village people and hoteliers rebuilt where needed and the Tsunami warning towers are all that can be seen. 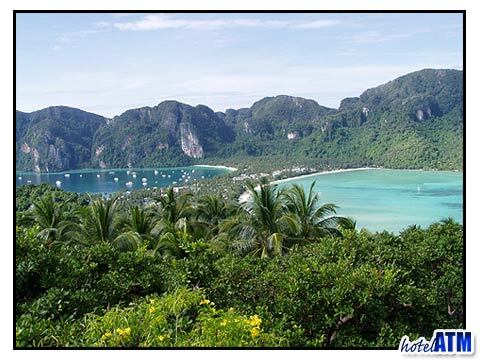 If you had visited Phi Phi island before the tsunami the obvious change is the northern beach of Loh Dalum where the PP Princess Resort, PP Charlies Resort, PP Pavilion Bungalows, and Tonsai Resort on Tonsai Bay have not been rebuilt. These beach areas are slowly being redeveloped and the full range of tours and activities and probably a better investment in hotel rooms has left a new improved Phi Phi island." 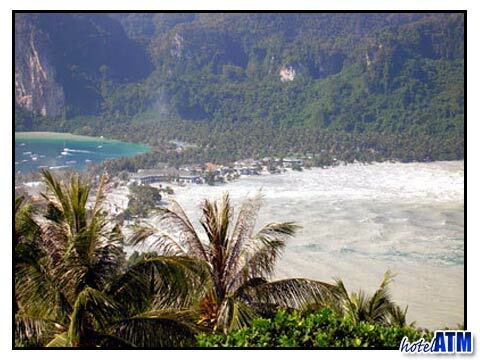 Probably the world media’s most recognized Phi Phi Tsunami help, Hi Phi Phi translates as Help Phi Phi. Quoting; "Hi Phi Phi is a community-based initiative of local Koh Phi Phi residents and non-Thais, working to help the people of Phi Phi rebuild their lives after the Indian Ocean tsunami of December 26, 2004." Islanders and volunteers worked side by side to clean streets and reefs, repair homes and bring back smiles on Thailand"s most beautiful tropical paradise. Although much long-term work remains ahead for the emotional clarity of the Phi Phi islanders, especially who lost their family members, Phi Phi is back on its feet and ready for life. There are now over 160 shops re opened with all the work done by volunteers clearing rubble, rebuilding and rendering walls, painting, re wiring and plumbing. Hi Phi Phi in many ways, was the catalyst for the re birth of the island as many shop owners were waiting for the island to get going before returning. The volunteers also started to create their own economy by buying goods in the newly reopened shops and staying in the bungalows. This in turn started to bring the confidence back in the local shop owners that there would be life after the Tsunami. This encouraged them to stay open and the word spread that Phi Phi was back and open for travelers and tourists alike. Phiphi-releve-toi.com focused on defining the tsunami effect on the Phi Phi Island and actively seeks donations for specific measurable goals ie 10 fishing boats and sponsoring 57 senior persons. Phi Phi Maphrao Resort set up a collection for various needs including putting children who lost parents through school, boat engines for fishermen, mattresses, sleeping mats, mosquito-nets, carpentry tools, toys, baby-bottles, powder-milk, canned and fresh food, kitchenware. Working with Embassies and NGO’s they were able to channel donations to those needed. Friends of Phi Phi Association was a fully registered Charity with the NSW Gaming and Racing Association (charity number CFN18253). In their mission statement they help raise funds for the rebuilding of the local school, hospital and sanitation facilities and assist in the promotion of tourism. Set up by interested parties within the legal fraternity in Australia it has worked closely with the Thai government in Krabi. Phi Phi Island; Rising above the Waves. Close to my heart, Paul set up a donation on account of the loss he felt for my nieces who died in the wave. Quoting the website: "We lost many friends, and are raising money for their dependents, helping them to start again." The 4Kali.org Foundation was created in honor of Kali Glynn Breisch and thousands of others from 28 countries who lost their lives in the tsunami of 2004. A Christian-based organization with a broad-based family of projects making a difference in communities around the world. Hi Phi Phi is a community-based initiative of local Koh Phi Phi residents and non-Thais, working to help the people of Phi Phi rebuild their lives after the tsunami.